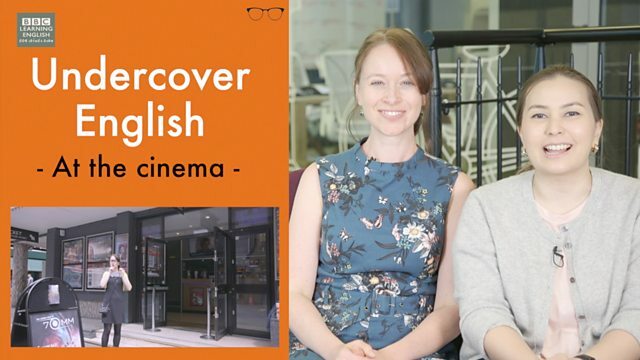 Here's the second episode of our new series - Undercover English - where Sian and Clare go undercover in the UK to help you learn real, spoken English. Today, Sian is going to the cinema. Join her to find out how to buy a cinema ticket in the UK. What do we call 'a line of seats in the cinema' in English? 1) How do you ask for a cinema ticket in English? Can I have one ticket for (film name) on (day), please? 2) In some cinemas you may be able to choose where you want to sit. What can you say? 3) When it's time to pay, what questions might the server ask you? The film doesn't start as soon as the doors open. If the doors open at 7.30, what does that mean? What 2 questions did the man ask Sian when it was time to pay? When it's time to pay, which question is the server NOT likely to ask you? Can you remember how Sian said it? Which letter is not pronounced in the word 'receipt'?